Grace Cossington Smith loved to draw and continued the practice over her long career, including resolved works for exhibition, studies for paintings and drawings for personal use. Among her earliest drawings were images of everyday life at home in Sydney’s northern suburbs, with images of her home and its environs, and portraits of her family. 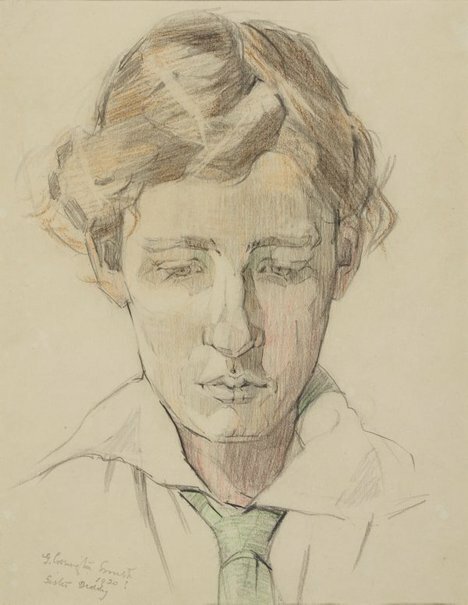 Cossington Smith’s parents, siblings and later nieces and nephews were willing and available subjects for the artist; this drawing is of her younger sister Charlotte (“Diddy”, 1897-1962). Cossington Smith’s sketchbooks (now in the National Gallery of Australia) include several images of Diddy, characteristically pictured reading with her eyes downcast and feet propped up, images of domestic contentment and leisure. Diddy remained living at home in the Smith household with her sister Grace until the mid 1920s, when her career as a nurse progressed. Diddy is the subject of another Cossington Smith work in the Gallery collection, a painting titled ‘The reader’ c.1919. Signed and dated l.l., pencil 'G. Cossington Smith/ 1920?/ Sister Diddy'. Ruth Prowse, thirty years of collecting , Canberra, 2004, 15 (illus. ).